Whistler is (Grizzly?) Bear Country. For the most part, our local bear population has adapted well to the expanding human presence in Whistler. Michael Allen photo. Justified as it may be, celebrating our thriving black bear population obscures one crucial fact: Whistler is also grizzly bear country, or, at least, it very recently was. 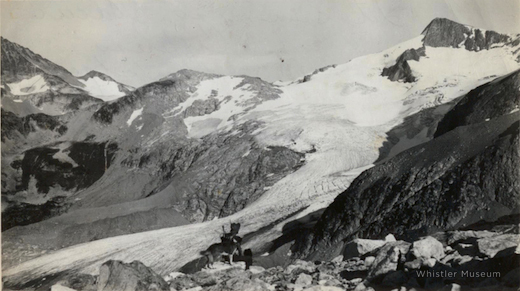 Earlier in the twentieth century it was not uncommon to see these tawny giants on the slopes surrounding Whistler, and they often wandered into the valley itself as was reported by local trapper Billy Bailiff in a 1935 provincial wildlife survey by the Royal BC Museum. Grizzlies were most commonly encountered in the gently rolling country to the southeast of Whistler Mountain familiar to backcountry skiers and hikers as the Musical Bumps and Singing Pass. The wide expanse of open meadows and sub-alpine parkland provides a diversity of niche environmental conditions perfect for supporting an array of wildlife, big and small. 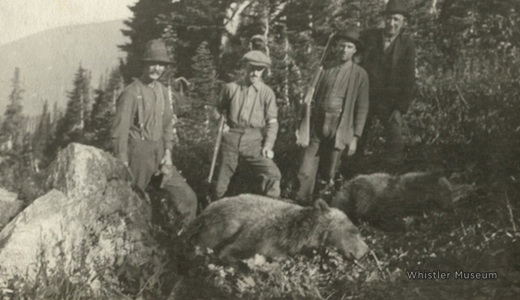 Hunters with 2 trophy grizzly bears in the Singing Pass/Musical Bumps area, circa 1916-17. The “line of extinction” as it’s sometimes called has moved, save for a couple of pockets, from Mexico north to the Pemberton Valley. Wolves, wolverines, and grizzlies are all animals that don’t do well around people, probably for the same reasons: huge home ranges, a tendency to get shot when near people, and general aversion to humans. Sure, living with bears has its challenges but we all recognize that it is more than worth it, which raises the obvious question: could grizzlies one day reclaim some of their lost territory? Perhaps more crucially, if it was possible, would we let them? While this most recent grizzly encounter near Squamish ended peacefully, there is still a long way to go before they are once again recognized as rightful residents alongside black bears. Of course, grizzlies are a completely different beast from their darker-haired cousins. For one, they’re bigger, hungrier, and require far larger swaths of undisturbed wild country to sustain themselves. They also require a rather different approach to conservation and management. In 1989 a stray grizzly wandered into Function Junction where it was shot and killed by RCMP officers after it started displaying aggressive behavior towards local dogs. A June 15th 1989 article in the Squamish Citizen about the encounter reported an RCMP representative’s statement that the bear was fatally shot because local authorities did not have the necessary expertise or equipment to safely tranquilize and relocate the animal. The same article also reported on the successful relocation of a black bear that same evening by provincial wildlife officials from the Creekside area. While it is easy to get disheartened, even cynical, when considering modern society’s seemingly unrelenting assault on the natural world, attitudes are changing (if slowly and unevenly). Plus, as this article shows, nature can be incredibly resilient. So what’s your take on all this? Should we encourage grizzlies to return to the surrounding hills which they called home for thousands of years, or are they simply too dangerous to co-exist with us humans (despite contrary evidence in Northern BC, the Rockies and Alaska)? Have we modified the local environment too much to enable such a homecoming? Certainly these are questions that we, as a community, should be asking. For an eloquent take on the dwindling fate of southwestern BC’s grizzlies, and human-wildlife interaction in general, see the beautifully filmed episode of The Nature of Things “The Last Grizzly of Paradise Valley.” (shot in the North Cascades near Princeton, not the Paradise Valley north of Squamish). 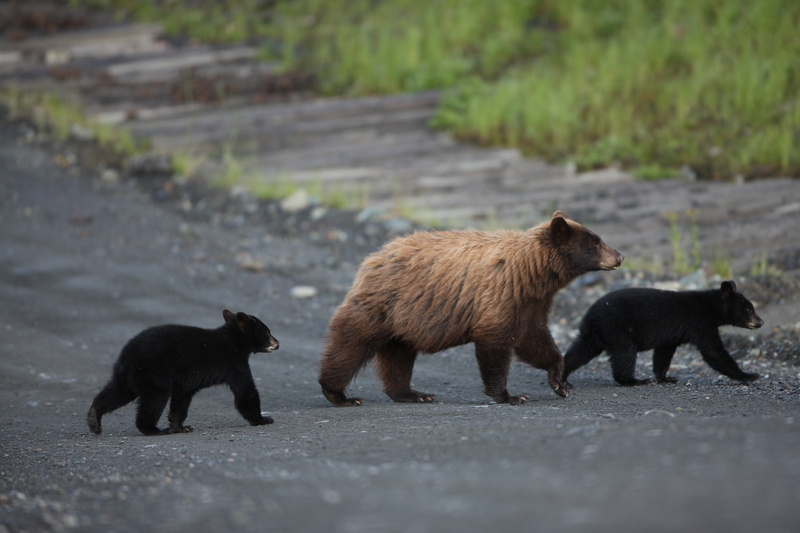 This entry was posted in Environment and tagged black bears, Garibaldi Provincial Park, grizzlies, grizzly bears, Michael Allen, Whistler, Whistler Naturalists, wildlife conservation, wildlife management. Bookmark the permalink. Check out the 1976 horror film Grizzly. http://www.youtube.com/watch?v=_c1QA8wyTaA . Basically it’s Jaws but with a Grizzly Bear. So if the grizzly population were to become re-established in the region, we could shoot a sequel locally, supporting our budding film industry. Excellent point, Brad!